I just got back from a few days in the UK with my coach, Justin Daerr. 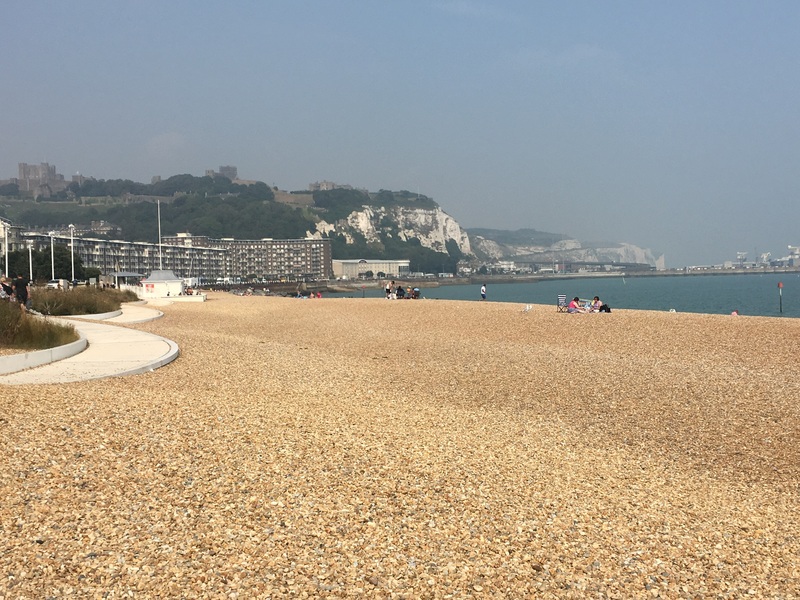 The trip was a bit of a whirlwind, with stops in London, Henley-on-Thames (with a swim event), and a quick trip down to Dover for some English Channel recon. It was the best of British swimming locales. Sticking primarily to public transit, I think we set a new record for number of rides: The tally included 4 flights, 2 plane trains in the Atlanta airport, 4 bus rides, 12 rides in the London Underground, 9 train rides, 1 ride on the Thames Clipper boat, 7 rides on the Docklands Light Rail, 2 ferry rides across the Channel, and 1 Uber ride! I think I’m worn out more from the public transit than from the swimming. 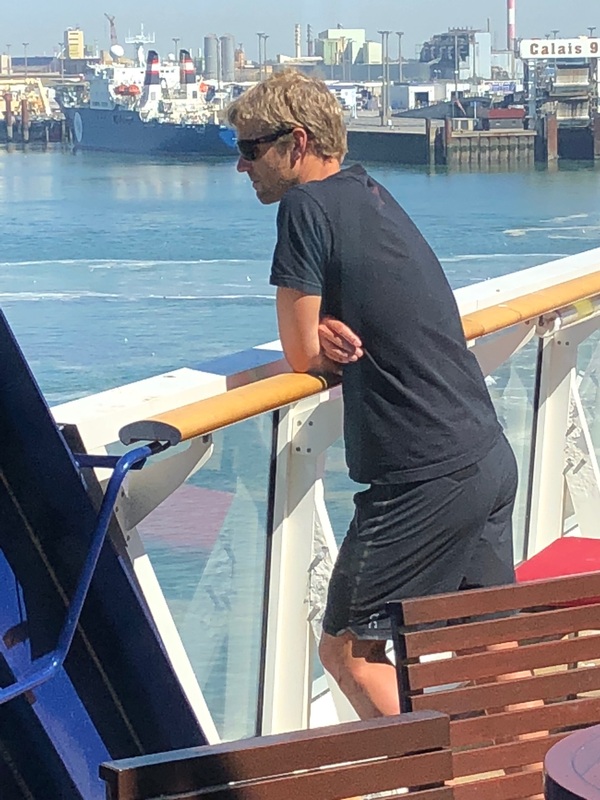 The trip was primarily for the purpose of swimming in Henley Swim’s Thames Marathon Swim, but we tacked on the trip to Dover so that I could introduce Justin to the Channel swimming scene. We had a terrific time. 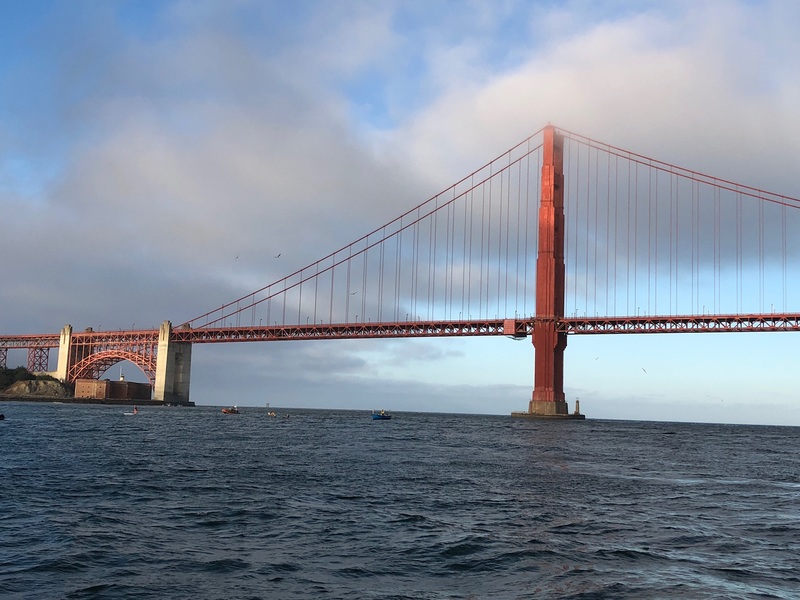 Here are some photos from the trip…. 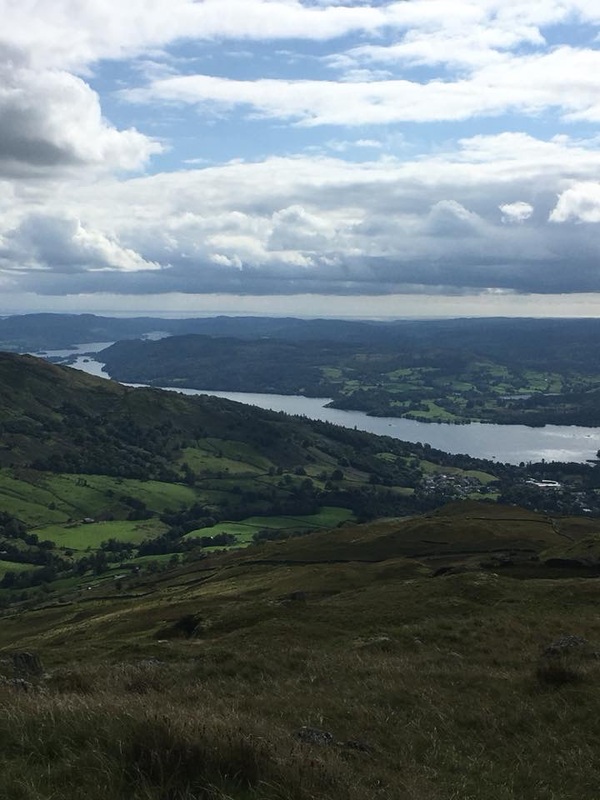 Next up for me….I’ll be returning to the UK in 3 weeks for a 10.5-mile swim at Lake Windermere in the Lake District. I’m looking forward to the trip and my longest nonstop swim yet. Our home for a couple days in London was the Canary Riverside Plaza Hotel. 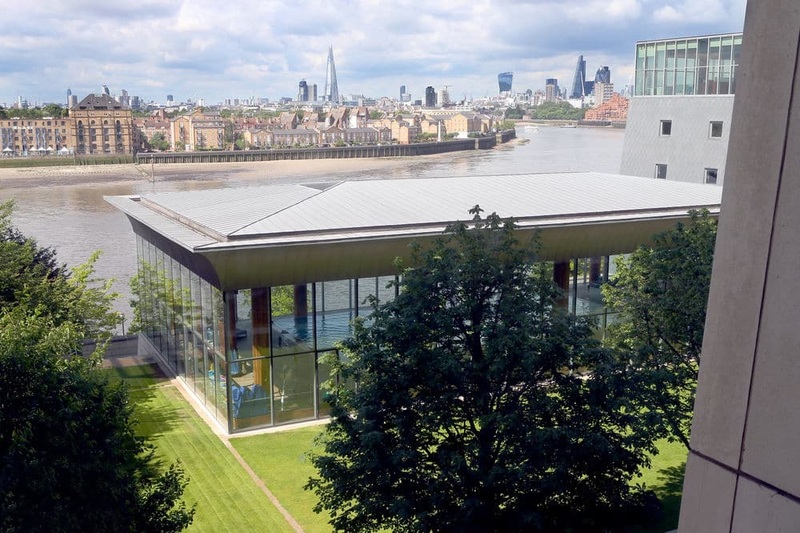 I’ve stayed here a couple times, in large part because of the awesome swimming pool alongside the Thames with panoramic views of London. 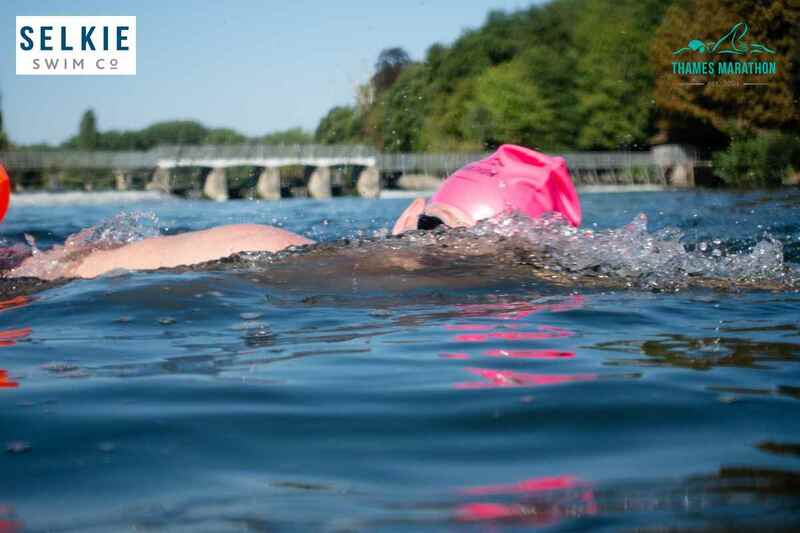 We had a chance on 2 successive mornings to swim at the Serpentine in Hyde Park, the site of the Olympic triathlon and 10-km open water swimming events. On this occasion we also enjoyed viewing–and swimming alongside–a temporary barrel sculpture by the renowned artist, Christo. 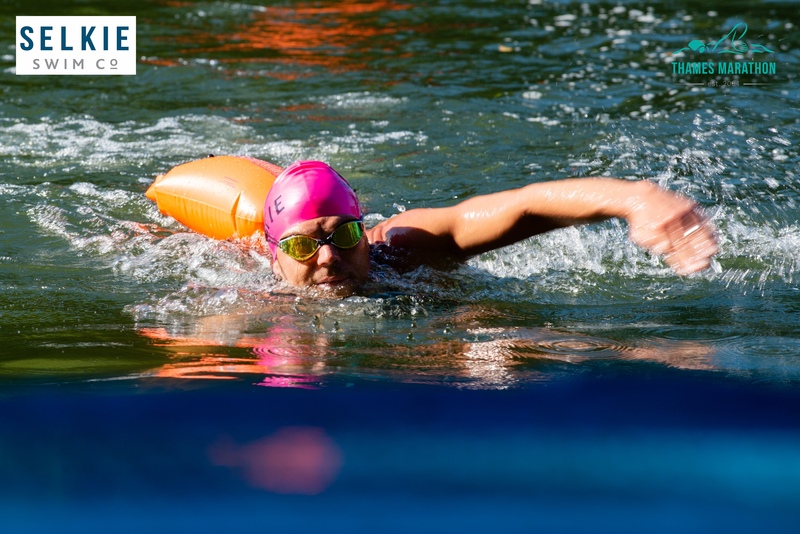 We joined (for a nominal fee) the Serpentine Swim Club, the oldest swim club in the UK so that we could do some “before hours” swimming and take part in the Club’s weekly Saturday morning race, this time an 880-yard event. I think Justin was the winner, taking the other Serps by surprise, I’m sure. The local swans also enjoy swimming in the Serpentine. They’re surprisingly unflustered by the swimmers. 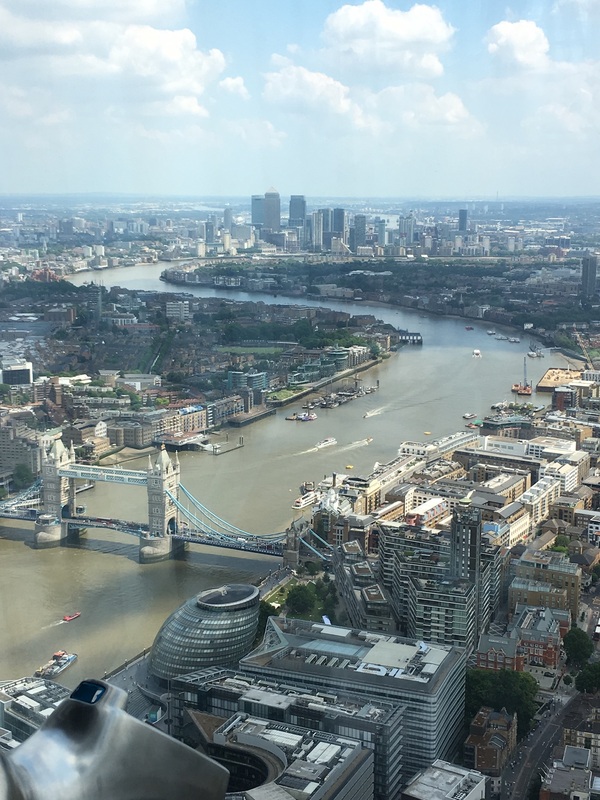 Before heading to Henley, we did a little sightseeing in London, including a trip to the viewing gallery at the top of The Shard, London’s tallest building. 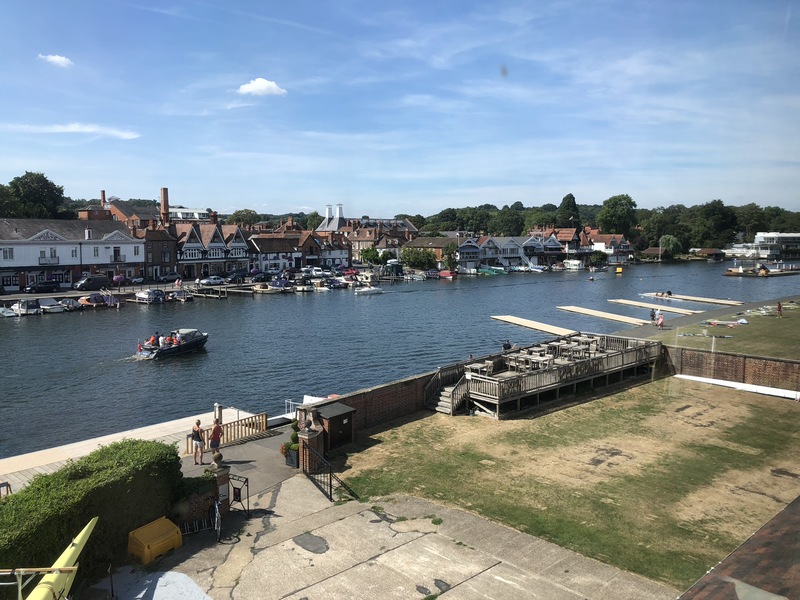 The primary purpose of the trip was to swim in Henley Swim’s Thames Marathon Swim, a 14-km route from Henley-on-Thames (shown here from my room) to the town of Marlow. In this section of the river, there are a series of locks and dams to allow for recreational water activities. It also meant that there were 3 short breaks–and aid stations–where we’d get out and walk around the locks. 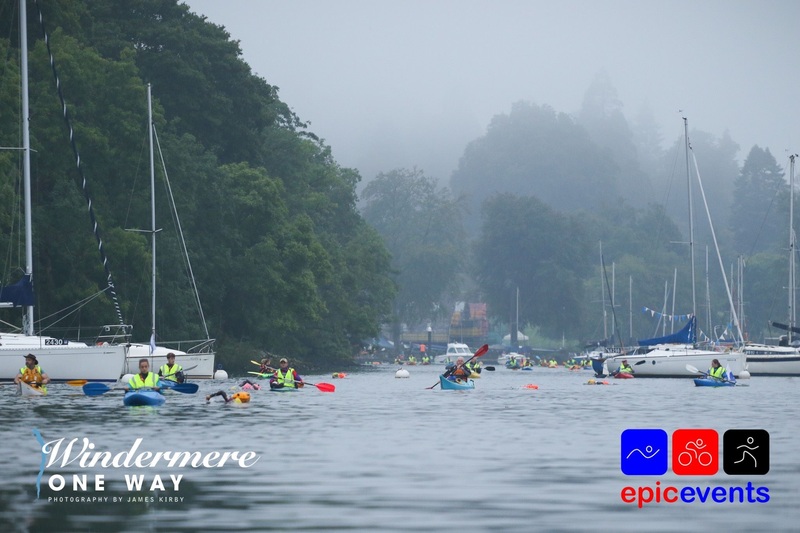 For anybody looking to #GoLong in the swim, this is an awesome event–very well organized and a chance to swim no more than 25 yards from shore. This was my 2nd time for this swim event. I was also here in 2013. This time, I was excited to snare a non-wetsuit entry. Here, Justin and I are next to the large buoy ready to start the race. The race photographer did a good job of capturing Justin…. and me about 10 km into the swim. Next, it was off to Dover for a very quick look around. Here we have Swimmers Beach at Dover Harbor and the White Cliffs of Dover in the background. 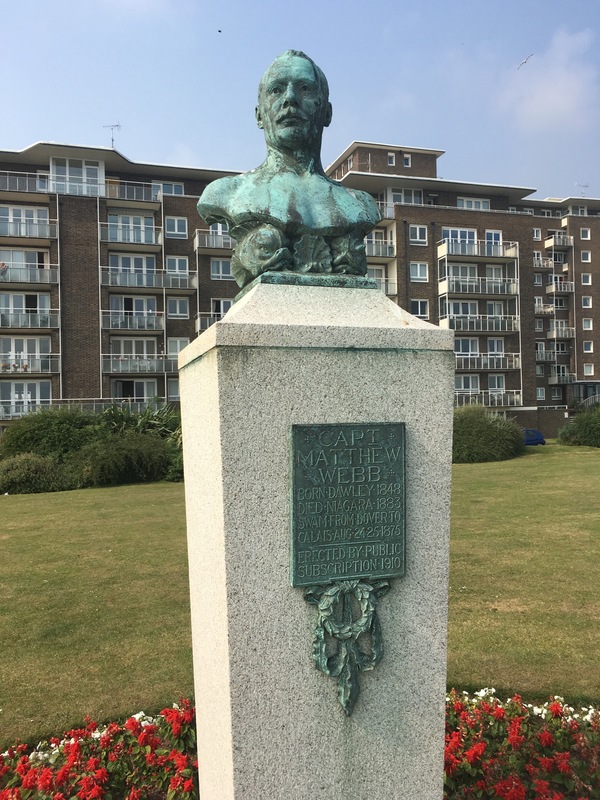 It’s great to visit the statue on the waterfront of Matthew Webb, the first swimmer to cross the Channel, in 1875. Our last activity was a ferry trip across the Channel to the French port city of Calais, to get a measure of the Channel. The weather was terrific, mostly sunny and with calm seas. 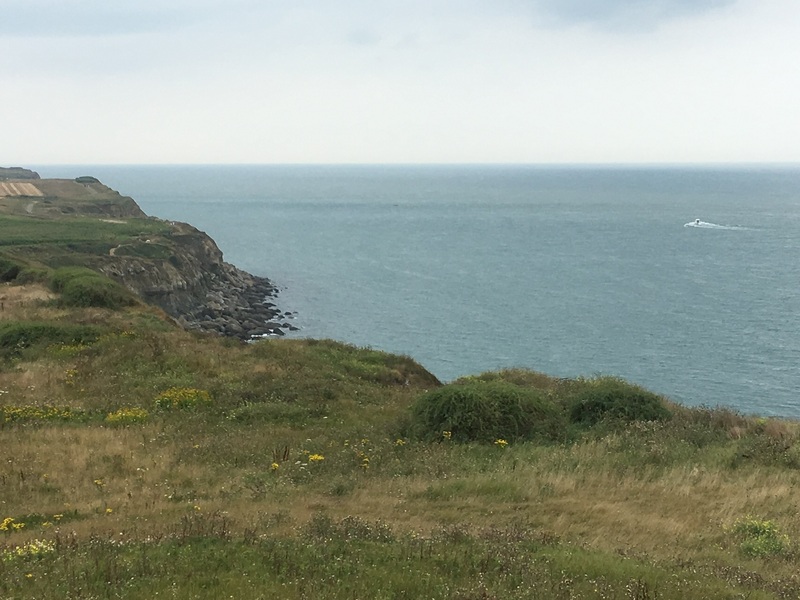 We took a drive down the French coast to Cap Gris Nez, the nearest point of land to England. The White Cliffs of England, though 21 miles away, look deceptively close. The day of our visit, 9 pilot boats were escorting swimmers–7 solo swimmers and 2 relay teams–across the Channel. The luckiest finished their swims at the foot of this cliff. Some happy swimmers, no doubt! In a study reported today in the New England Journal of Medicine, Dr. Sanjay Sharma and colleagues from the University of London offer the most comprehensive look yet at the utility of cardiac screening for young, competitive athletes—in this case, specifically for elite, adolescent British soccer players. We’ve long known about the small risk of sudden cardiac death (SCD) among young, competitive athletes, but very few datasets have been assembled to look carefully at the value of cardiac screening in these athletes. Over a 20-year period from 1996 through 2016, the English Football Association used a combination of health questionnaire, physical examination, electrocardiogram (ECG), and echocardiogram to assess the heart health of all 11,168 potential soccer players, aged 15-17 years, who were joining the Association. Because the ECG and echocardiogram were included, we might characterize the cardiac screening as comprehensive, or “aggressive.” Information was then gathered about any of these players who later died, with a focus specifically on deaths due to heart-related conditions. The investigators were then able to return to the athlete victims’ initial cardiac screening to see what lessons could be learned. The cost of the initial cardiac screening was $342 per athlete. 42 athletes (0.38%) were found to have cardiac diseases that could cause sudden cardiac death (SCD). Among these 42 athletes, all of those with forms of cardiomyopathy or long Q-T syndrome were advised not to participate in sports. Another 225 athletes (2%) were found to have other, non life-threatening cardiac diseases such as heart valve problems or congenital heart conditions. In many cases, these athletes received medical or surgical treatment that allowed them to return to play. A total of 830 athletes (7%) required additional testing to sort out any potential heart problems detected by the initial screening procedure. After complete evaluation, 544 athletes (5%) required long-term monitoring for non life-threatening heart conditions. The deaths occurred anywhere from 0.1 to 13.2 years after the initial cardiac screening. 7 deaths (88%) were caused by hypertrophic cardiomyopathy (HCM), which is known to be associated with SCD. 5 of these 7 deaths due to HCM occurred in athletes with a completely normal screening examination. 2 of these 7 deaths due to HCM occurred in athletes in whom HCM was diagnosed at the initial screening, but who chose to continue to participate in sports and exercise gainst medical advice. This study is important because it provides a “real world” look at the use of cardiac screening for young, competitive athletes. Here, we see that an “aggressive” approach to cardiac screening that includes health questionnaire, physical examination, ECG, and echocardiogram is useful to identify athletes at risk for SCD as well as those who require some sort of evaluation and treatment for non life-threatening forms of heart disease. The findings of the study in this regard are not surprising. In a setting in which comprehensive, long-term follow-up is possible, this study’s estimate of the risk of SCD among the screened athletes is likely to be very accurate. Moreover, the incidence of SCD at approximately 1 per 15,000 is a bit greater than previously thought. There should be no doubt, though, that the incidence of SCD will vary among different cohorts of athletes, of different abilities, and participating in different sports. The study raises some worry, though, about the effectiveness of “aggressive” cardiac screening programs. 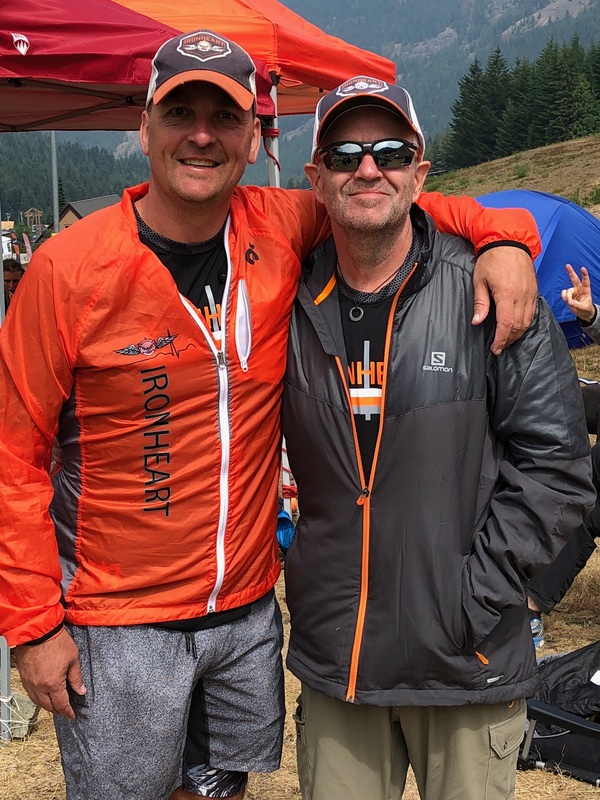 First, it is not clear why 2 athletes diagnosed with HCM would be allowed to continue to participate against medical advice and it is truly sad that these athletes later died. But more worrisome, though, is the finding that 5 other athletes died because of HCM that was not detected during the cardiac screening. Review of ECGs of these athletes confirmed, in fact, that they were normal. Perhaps we have an undue faith in the ability of ECG and echocardiogram to identify HCM and other potentially life-threatening conditions. These findings raise the possibility that an initially negative cardiac screening cannot provide complete reassurance that athletes are risk-free for SCD and raise the question about the need for periodic cardiac re-testing in the years after an initially negative screen. I think there will be a bunch of headlines in the press about this study and most of the reporting will focus on the athletes who died after a supposedly normal cardiac screening exam. 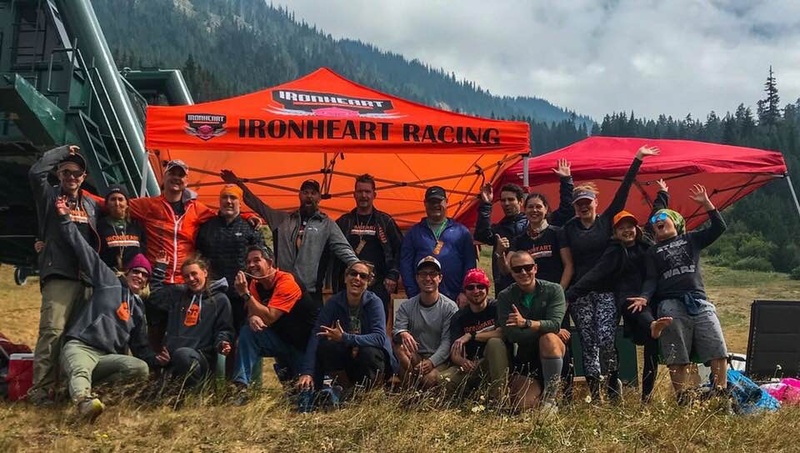 We will need to keep in mind, though, the positives about cardiac screening—namely, the many other athletes who learned they had a variety of heart conditions that could be treated successfully and allow them to return to play. Some readers here at the blog will remember that I once wrote a monthly column for Endurance Corner, a multisport coaching outfit. Many of the links to those articles are no longer active, as readers have pointed out. 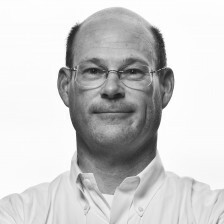 One of the most popular Endurance Corner articles was a 2010 article entitled “Caution! 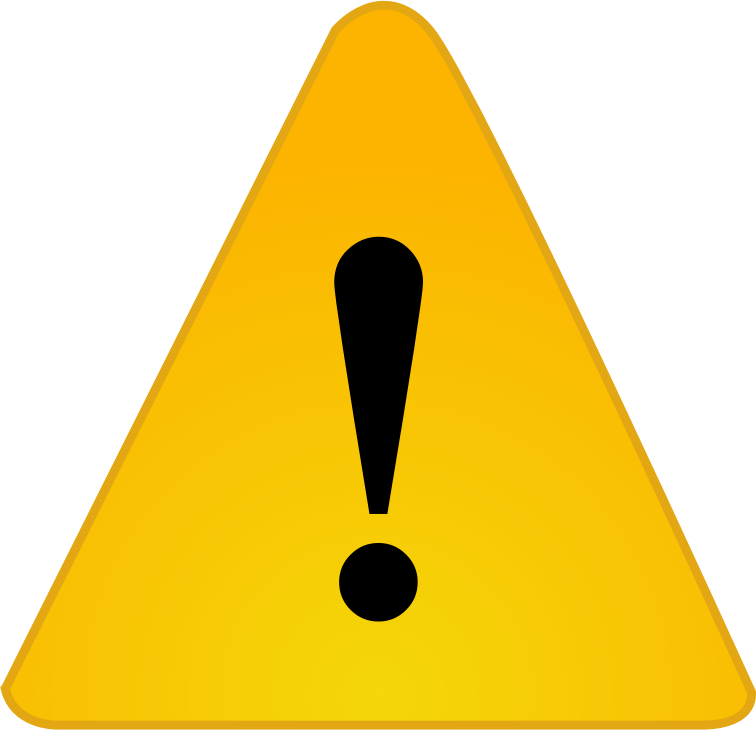 The Five Warning Signs You Shouldn’t Ignore.” I thought I’d update the article here at the blog, and include an additional, sixth warning sign that athletes should also be aware of. Over the years, I’ve noticed that my athlete friends seem to be very “in touch” with their bodies. They can be hyper-vigilant about the first signs of “swimmer’s elbow” or plantar fasciitis or leg muscle strain. They’re also apt to be proactive about dealing with these problems. Maybe that’s just because it’s sometimes easy to self-diagnose a musculoskeletal problem and easy to self-prescribe rest, ice, or analgesics. Maybe over time, they’ve learned the lesson that early intervention can head off bigger problems later on. That’s an important lesson, too. 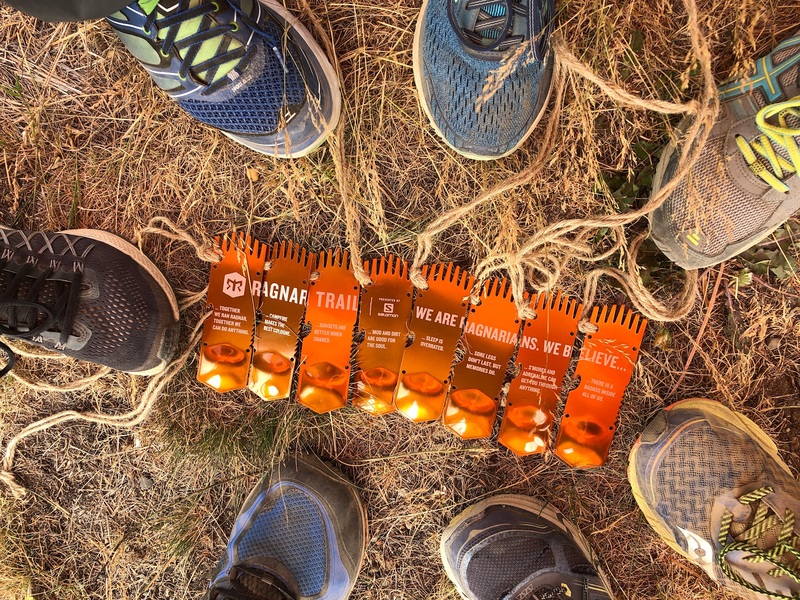 I’ve also noticed, though, that my athlete friends sometimes give short shrift to some of the warning signs of potentially more worrisome problems—problems that stem from the heart or cardiovascular system. In my experience, it seems that men are worse than women. Like I’ve mentioned in previous articles, young “healthy” men just don’t like to go to the doctor. It’s easy to think that we’re invincible and ignore serious warning signs until they simply can’t be ignored any longer. But just like plantar fasciitis, it’s always best to recognize and deal with any serious heart-related problem earlier rather than later. Here’s my short list of six warning signs that you shouldn’t ignore. These are symptoms that you should discuss with your doctor. Get reassurance if there’s really no serious problem and get thoroughly evaluated if your doctor believes there may truly be something wrong. Chest pain or discomfort. Once every few weeks I meet with a small group of third year medical students to talk about patient scenarios that involve chest surgery. One of the scenarios that we discuss deals with a young man with chest pain. I ask the medical students to come up with a list of the potential causes and I’m always amazed at how many answers are offered up. Sometimes they’re able to list 30 or more. That’s the way it is with chest pain—many, many potential causes. These include things like injuries to the chest, reflux disease of the stomach, inflammation of the joints between the ribs and breast bone, anxiety, and diseases of the esophagus, among others. The students are quick to remember the potentially life-threatening causes such as heart attack (acute myocardial infarction), collapse of one of the lungs (pneumothorax), tears (dissection) of the aorta, the large blood vessel that carries blood away from the heart, and pulmonary embolism, the condition where blood clots form and travel to the lungs. I suppose that any of these causes may be in play for an athlete with chest pain. But the particular scenario that’s most important for athletes is chest pain or discomfort that comes with exertion and is relieved by rest. This can be an indication of coronary artery disease (CAD) that is usually caused by plaque build-up in the coronary arteries that supply blood to the heart muscle itself. In its early stages, the pain can be very subtle, perhaps nothing more than a twinge. In its later stages, the pain can be crippling. The good news is that, working with your doctor, you can be evaluated to see if chest pain is due to CAD. A variety of treatments may be available depending upon your situation. Don’t ignore chest pain! Unexplained shortness of breath. As athletes, we’re all short of breath at some point—some of us earlier than others. And as athletes, we usually become accustomed to the level of shortness of breath that is associated with a given workout or level of effort. What’s worrisome is when there is some change to that pattern—when shortness of breath is unexpectedly out of proportion to what you’d ordinarily expect. That’s when the alarm bells should go off inside your head. Just like chest pain, there are a myriad of causes of shortness of breath, ranging from pulmonary or bronchial infections, to asthma (potentially made worse with exercise), to blood clots in the lungs (pulmonary embolism). For athletes, the most worrisome sign might be shortness of breath that persists after exercise stops or shortness of breath that occurs at rest. Both are signs that a heart condition may be responsible. This is a warning sign that you should report to your doctor. Loss of consciousness. Much of medical school involves learning a big vocabulary of new “medical” words. Our word for sudden, unexpected loss of consciousness is syncope. Patients will use a variety of terms like “blacking out,” “passing out,” “falling out,” or even just “lightheadedness” or “dizziness.” Again, there are many causes, such as dehydration, side effects of various medications, etc. For athletes, one common scenario is near-syncope or syncope at the end of a workout, when the exercise is stopped abruptly without a period of cooling down. Thankfully, that situation can be avoided just by remembering to have an appropriate cool-down after each workout. The most worrisome type of syncope occurs during exercise. This almost always indicates a serious underlying medical problem—and often related to the heart. All cases of syncope should be discussed with your doctor, but it’s particularly important (bordering on emergency) to be evaluated if you have syncope during exercise. Unexplained fatigue. Like shortness of breath, all athletes are familiar with fatigue. Almost regardless of the sport, fatigue just comes with the territory. It’s important to remember that, besides exercise, there are many causes of fatigue, including depression, the side effects of various medications, and anemia, among others. It’s also true that fatigue can be a symptom of underlying heart disease. Athletes become accustomed to the degree of fatigue that is associated with any particular workout or load and they should be acutely aware when there is a change to this pattern. Whenever there is a sudden change in an athlete’s pattern of fatigue or when the fatigue persists for an excessively long time, it’s important to get evaluated. Find out what’s going on. Palpitations. Of the first five of these warning signs, palpitations—the feeling of an abnormally strong, fast, or irregular heartbeat that just grabs your attention—is undoubtedly the most common among athletes. It’s an unusual problem in school-aged athletes, but is very common among middle-aged endurance athletes. In some reports, as many as 70% of adult athletes report this problem. The palpitations may occur during exercise or at rest. We could make a long list of specific arrhythmias (abnormal heartbeats) that explain palpitations in athletes. The most common problems are due to abnormal heartbeats or rhythms (like atrial fibrillation) that start in the upper chambers of the heart (atria). Most of these arrhythmias are benign and require no treatment. But if you’re bothered by frequent palpitations, it is best to find out exactly what’s causing them, because they’re sometimes a sign of underlying heart problems that do require treatment. Resist the urge to ignore this problem. Unexplained decrease in performance. I didn’t include this warning sign in my original list back in 2010, but I’m adding it here because of what I’ve learned over these past few years. By decrease in performance, I’m talking about an unexplained decrease in pace, endurance, or perhaps other measures of performance. Needless to say, there could be many reasons for such a decrement, including (poor) nutrition or hydration, various illnesses or injuries, the distractions of life outside of sports, depression, or even, simply, aging. All of those potential causes deserve attention, of course. But I’ve also seen cases where an unexplained decrease in performance, in the absence of any of the other five warning signs above, was the only indication of a serious heart condition. In situations where a decrease in performance persists despite consideration of the more innocuous causes, evaluation by your doctor with a particular eye toward hidden heart problems may be in order. I realize this is a short list. But by paying attention to just these six warning signs, athletes can uncover many of the potentially serious underlying heart-related conditions that could place them at risk. Do this for yourself and remind your athlete friends, too. There can be tremendous value in getting a second opinion. I’m certain about that. At times, though, the process of getting a second opinion can cause unnecessary angst for patients and doctors, alike. It shouldn’t. Here’s my take. What do we mean by a second opinion? Gathering information (eg, records, test results) that formed the basis for the first opinion for some new doctor to review. An in-person visit with the second doctor for the purpose of an interview and physical examination. A discussion with this doctor, where the second opinion is shared with the patient, highlighting the similarities and differences from the first opinion. Most commonly, we’re talking about second opinions from medical specialists or subspecialists rather than primary care physicians (PCPs). When is a second opinion helpful? Here are some situations where second opinions can be helpful. For each situation, I’ve included an example of an athlete-related heart problem. When the diagnosis is uncertain. Not everything in medicine is black and white. As they say, the practice of medicine is both an art and a science. Sometimes, even when all of the relevant information has been gathered, it’s still not possible to decide with certainty as to a diagnosis. In this situation, a second opinion may help to sort out the diagnosis by bringing additional experience as well as a fresh set of eyes and ears to the problem. An example. The condition known as hypertrophic cardiomyopathy (HCM) can be a difficult diagnosis to establish. There are known genetic mutations associated with this condition, but only a small percentage of cases can be diagnosed that way. In many cases, the diagnosis depends on the findings from echocardiography, magnetic resonance imaging (MRI), clinical features, and family history. In some athletes, there can be particular difficulty in distinguishing between an athletic heart, simply the result of exercise, and HCM. It’s easy for this diagnosis to be uncertain. In this situation, a second opinion may help to gather consensus about the diagnosis or suggest additional diagnostic testing that might be helpful. When the treatment carries high risk, is expensive, or is logistically difficult. The diagnosis is settled and the conventional treatment involves a fair bit of risk. Often, we’re talking about a surgical procedure. In this situation, a second opinion may bring clarity to the need for treatment and confirmation that the planned treatment is appropriate. An example. The condition known as bicuspid aortic valve (BAV) can involve regurgitation (leaking) of the aortic valve as well as enlargement of the nearby aorta to form an aortic aneurysm. When this diagnosis is established in a non-emergency setting and the patient requires replacement of the aortic valve and the nearby aorta, there are often several related, but technically different, surgical options. There are different types of prosthetic heart valves and different types of substitutes to take the place of the aorta. In each of these variations, though, the operation carries a fair bit of risk, is expensive, and can be logistically difficult, especially if operation must be pursued some distance from home. Here, a second opinion can be helpful to be certain about the diagnosis and the need for operation; provide clarity about how soon an operation should be performed; provide additional discussion about the various surgical options, with the advantages and disadvantages of each; afford an opportunity to re-address the amount of risk that comes with operation; and offer thoughts about the expected recovery timeline and return to exercise. When there are several treatment options to choose between. After a diagnosis is established, the usual next step is to settle on a treatment. For many conditions, however, there can be several treatment options. Ordinarily, doctors like to share these possibilities with a patient and then decide together which treatment is best. This choice might depend not only on the medical specifics, but also the patient’s social, work, family, financial, cultural, or religious situation. But sometimes, even after discussion, it may not be easy to choose the best treatment. In this situation, a second opinion can sometimes be helpful to explain, from another doctor’s perspective, the treatment possibilities along with the advantages or disadvantages of each option. This doctor might well include additional or different possibilities or share the opinion that some of the previously considered possibilities may not be appropriate. An example. One common arrhythmia problem in athletes is atrial fibrillation, or “Afib.” This is a problem that can be nagging or persistent over months or even years. Once an athlete patient has had this diagnosis established, there are often many options regarding treatment: lifestyle changes like losing weight, stopping tobacco or alcohol use, or moderating extreme exercise; medicines like aspirin, anticoagulants, or anti-arrhythmics; and procedural treatments such as arrhythmia ablation or left atrial occlusion. Moreover, a patient will find that his primary care provider (PCP) and perhaps even his cardiologist may not actually perform such ablation or left atrial occlusion procedures. In this situation, a second opinion might help to review the various treatment possibilities from another doctor’s perspective, and get another take on the advantages and disadvantages of the various treatment possibilities. When it’s mandatory. Because of various regulatory frameworks, it’s sometimes necessary to get a second opinion before a patient can receive a particular treatment. Regulations at the local hospital level, from insurance providers, or from the federal programs like Medicare and Medicaid may all come into play in this regard. An example. For patients with severe, symptomatic narrowing of the aortic valve (aortic stenosis), we often recommend aortic valve replacement (AVR). In recent years, a new approach for AVR, trans-catheter aortic valve replacement (TAVR), has become available for select patients. To satisfy requirements of the FDA and the Medicare program, patients must get opinions from two heart surgeons before they qualify for the TAVR procedure. In this situation, the second opinion is essentially mandatory. When is a second opinion not helpful? In an emergency situation. Second opinions are usually not logistically possible in an emergency situation. Here, patients must usually rely on the doctors that are tending to their emergency condition, even in the situations I’ve outlined above. When the patient is already in the hospital. Once admitted to the hospital under the care of one or more doctors, it can be difficult to pursue a second opinion, at least in the common sense. If the condition or situation is not an emergency, sometimes it’s possible for partners of specialists to add their opinion, less formally, about a particular issue. When two or more previous opinions are already similar. There is a diminishing return with multiple second opinions. When there is already a chorus of similar opinions, it’s likely the next opinion will also be similar. In general, it’s probably not wise to chase after the opinion you want. 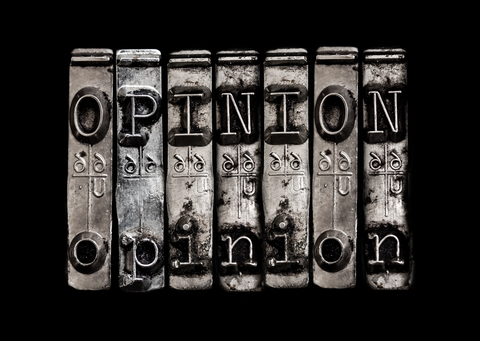 If you search long enough, you might find that opinion, but remember that there is usually value to consensus among the opinions you’ve received. Outlying opinions should be treated cautiously. How to find a second opinion? Ask your primary care provider (PCP). For patients who are fortunate to have a PCP, this may be the best source of a recommendation about how and where to seek a second opinion. Your PCP will know the local medical landscape. In many cases, he may have referred you to the specialist for your first opinion. But he will also know which doctor to suggest next, whether that’s another doctor in your community or one that’s farther away. Ask your specialist. You can certainly ask the specialist who provided your first opinion. Some specialists will be more helpful than others when it comes to identifying a good choice for a second opinion. You may find that it’s easiest for your current specialist to suggest a partner who might also take a look at your situation. Do some (online) research. There’s a lot of information online about specialists who you might visit for a second opinion. Perhaps there’s too much information. It can sometimes be challenging to sift through all of this information and make judgements about its quality. You may find that you will need to travel some distance to see a particular specialist. The danger here, though, is in not understanding the medical details sufficiently to select just the right doctor. And sadly, sometimes if you choose the wrong type of specialist, this may not become obvious until after you’ve invested in a visit. Another approach may be to select a large medical institution and have that institution help with finding just the right doctor to see you after they get some information from you and perhaps gather some medical records. Word of mouth. At first, word of mouth may sound like a great way to find a doctor for a second opinion. Indeed, you may have friends or family that could suggest a doctor that they’ve seen and liked. The challenge here is that it can be difficult to find just the right doctor unless your family or friends have the exact same medical problem that you do. Sometimes doctors obtain second opinions without their patients even knowing. This is just good practice. In this situation, the process may happen behind the scenes. Your doctor may share your particulars with a colleague to ask for help in settling on a diagnosis or settling on the best treatment. Your surgeon may ask a colleague to join him in the operating room to help decide what to do with an unexpected finding. Your pathologist may “send out” your biopsy specimen to get an additional opinion from a center of expertise. These sorts of second opinions are everyday occurrences. We should wrap up with talking about when to change doctors. So far we’ve been talking about getting additional, or second opinions. Most often, this is done with the intention of continuing to receive care from your first doctor. But what if you’d like to change doctors? There’s nothing wrong with wanting to receive your ongoing care from the doctor who gave your second opinion. That’s your decision and your doctors should understand making a change like that. I suggest that straightforward discussion with your doctors is the best way to make such a change. When you are concerned about honesty, transparency, or communication with your current doctor. When you have reasonable concern about experience on the part of your doctor, clinic, or hospital.